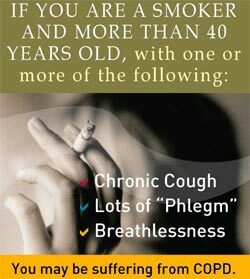 This chronic lung disease is a major cause of illness, yet many people have it and don't know it. Answering these questions can help you find out if you are likely to have COPD. You will have the results instantly after answering all five questions and clicking on "Submit" button. All information and advice shared is for informational and educational purposes only. Please consult a doctor for your medical needs.